Malurus squamiceps Cretzschmar, 1827, Transjordan. Three subspecies. French: Cratérope écaillé; German: Graudrossling; Spanish: Tordalino Arábigo. 11 in (28 cm). Slender grayish brown, long-tailed bird, which may remind Americans of thrashers (Mimidae). Plumage identical in both sexes, but male's eyes pale yellow, female's brown. Israel (Negev, Dead Sea Depression, Arava Valley, Sinai), Jordan, coastal Arabian Peninsula (except for Red Sea Coast). Dependent on vegetation and water sources, but otherwise a dry country bird, favoring acacias, tamarisk, saltbush, and date-palm groves and gardens. Complex social system, reminiscent of wolves. Lives in groups of six to a dozen, but sometimes more than 20, composed of an alpha breeding pair, usually the oldest birds, which maintain a strict dominance hierarchy over rest of unit. Groups compete with others for fixed territories, and may displace them, sometimes violently. Most unit members related to breeders, but some recruitment of unrelated birds from nearby colonies. When not actively foraging, generally secreted in bushes. Opportunistic feeders, energetically foraging in groups for anything edible. Main items include very wide variety of arthropods, small reptiles, berries, flowers, nectar, seeds, and garbage. In some units, only the alpha male mates with any of the females. In others, subordinate males may breed with subordinate females, but the alpha female is always the one most fiercely defended by the alpha male. Courtship behavior appears to be initiated by females soliciting subordinate males in the group, causing the alpha male to aggressively prevent copulations. No copulations take place if other members of the group are present. (As a rule, they actively interfere with impending matings, only dominant males being able to prevent other group members from following potential breeding pair). Successful copulation takes place in seclusion of bushes. Nest is large, untidy, cup-shaped structure, composed of coarse plant materials, with no clearly defined lining. Generally, only one is constructed in a group's territory. Up to three females may lay eggs in group's nest. Eggs are glossy turquoise. Clutch size per female varies from three to five. At night, only the alpha female incubates, but any female in the group may do so in daytime. Eggs take 13-14 days to hatch, and hatching may occur continuously through breeding season, so that nest may be occupied by large number of chicks of disparate ages. All members of group feed chicks, often competing to do so. Unusually long reproductive longevity for a passerine bird. Sexual maturity not attained until two years, some may remain non-breeders in group as long as six years. Individuals may still be group's alpha breeders at 13 years of age. 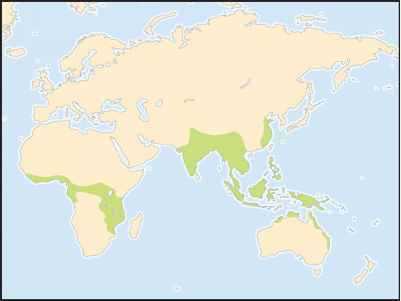 Globally non-threatened. Range has expanded, especially in Israel, due to irrigation and abundance of food (including garbage) around residences.